by Innovo Design Tritium Lightsaber Pendants Giveaway Winner: Congratulations to George M. of San Francisco, CA, winner of the pair of Tritium Lightsaber Pendants from by Innovo Design. Thanks to all entrants, and be sure to check the Dude homepage or Dude Giveaways section for your chance to enter our latest prize drawing. This giveaway concluded on April 15, 2018.
by Innovo Design is known for mixing industrial tastes with a radioactive glow. Now they're mashing up solid silver and Star Wars. With tritium subbing in for The Force. This week, the makers of standout jewelry and EDC are giving away not one, but a tag team of one of the coolest radioactive isotopes there is. Click here and enter to win a pair of Tritium Lightsaber Pendants from by Innovo Design! A $260 value! Tritium, also known as Hydrogen-3, is a radioactive isotope characterized by its ability to glow brighter (at least to the human eye) the darker its surrounding environment gets. While snuggling up to radioactive elements is typically not recommended, the tritium by Innovo Designs uses in their pieces has been hermetically sealed in glass, and is completely safe for human use and interaction. Its alluring neon glow requires no "charging" in daylight to work either; tritium's phosphorescence is natural and self-sustaining, with a long half-life of around 20 years. Lightsabers, also known as laser swords, are plasma blades powered by kyber crystals, characterized by their enhanced power when used in by Jedis in conjunction with The Force. Sadly, unlike tritium, lightsabers are also fictional. But combine the concept of a lightsaber with the reality of tritium, shrink it down to about a 1:8 scale, and Schvrmmmmmm! Fvish! you have this week's giveaway prize: a wicked duo of Tritium Lightsaber Pendants in your choice of color. by Innovo Design 3D prints their Tritium Lightsaber Pendants out of 925 solid silver, and ships them with one 3mm x 23mm tritium vial already installed (and sealed with resin, so not removable). 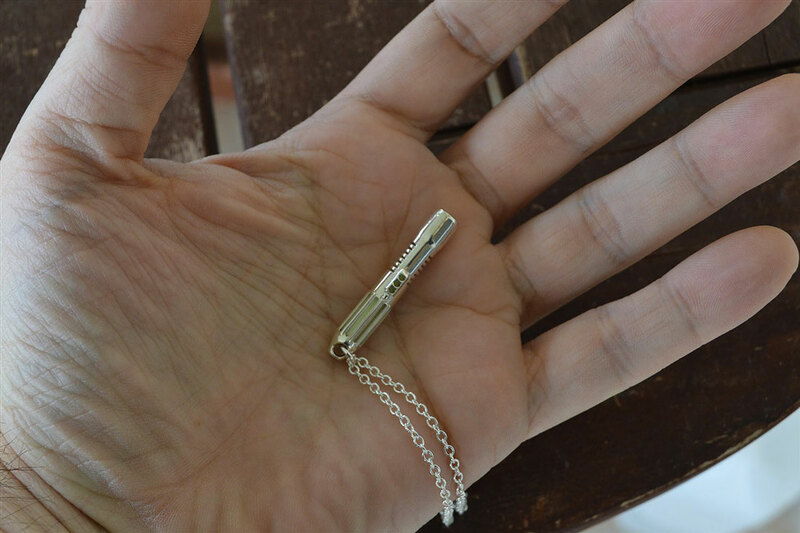 Total lightsaber dimensions are 37mm x 6mm, and each pendant also comes with a 50 cm, 925 silver-plated chain. Winners will have a choice of colors Green, Ice Blue, Purple, or Pink. by Innovo Design notes that all of the colors glow at different brightnesses, with green the brightest at 100%, ice blue at 80%, and then purple and pink at 40%. To register, click here and fill out the by Innovo Design Tritium Lightsaber Pendants Giveaway entry form. Or, if you're already a member of DudeIWantThat.com, when the magic entry form button appears, just click it to enter. 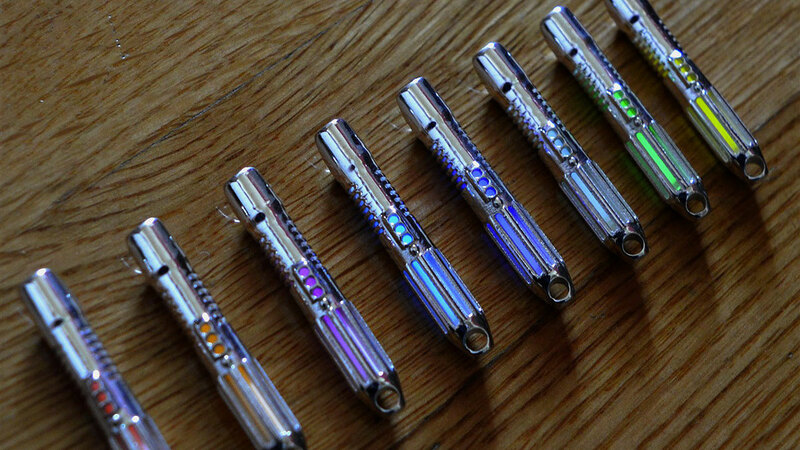 Giveaway prize includes: 2 x Tritium Lightsaber Pendants in winner's choice of Green, Ice Blue, Purple, or Pink. Total retail value is $260. Winner should allow up to 4 weeks for prize fabrication & delivery. In addition to the Tritium Lightsaber booty up for grabs here, By Innovo Design makes dozens of other types, styles, and colors of tritium jewelry and EDC accessories, all available through their online store. 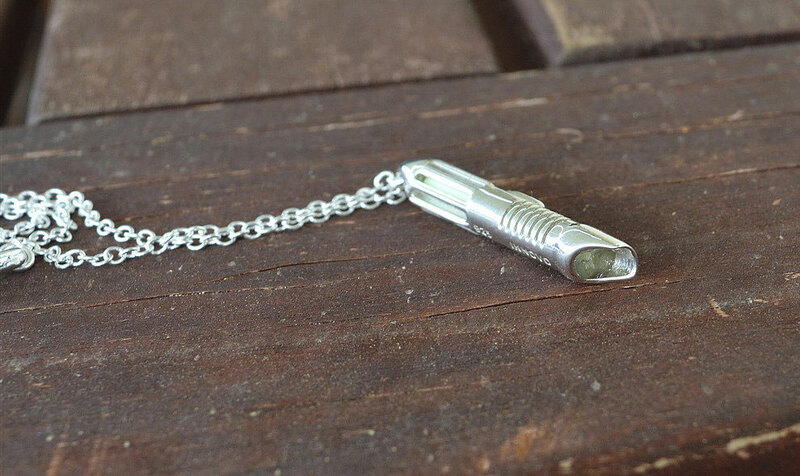 Choose from unisex rings, some bitchin' men's and ladies' pendants, titanium keychain locators ($45), a sweet silver, 4-vial tritium Quadratum necklace ($240) for your girlfriend, or just the tritium vials themselves to make your own radioactive creations.